Published in: Huisman, J.M., Harper, J.T. & Saunders, G.W. (2004). Phylogenetic study of the Nemaliales (Rhodophyta) based on large-subunit ribosomal DNA sequences supports segregation of the Scinaiaceae fam. nov. and resurrection of Dichotomaria Lamarck. Phycological Research 52(3): 224-234. The type species (lectotype) of the genus Dichotomaria is Dichotomaria marginata (J.Ellis & Solander) Lamarck. Type locality: Mombasa, Kenya (Silva, Basson & Moe 1996: 108). Lectotype: (Huisman, Harper & Saunders, 2004: 230). Adjective (Latin), soft, delicate (Brown 1956). Huisman, J.M., Harper, J.T. & Saunders, G.W. (2004). Phylogenetic study of the Nemaliales (Rhodophyta) based on large-subunit ribosomal DNA sequences supports segregation of the Scinaiaceae fam. nov. and resurrection of Dichotomaria Lamarck. Phycological Research 52(3): 224-234. Wiriyadamrikul, J., Wynne, M.J. & Boo, S.M. (2014). 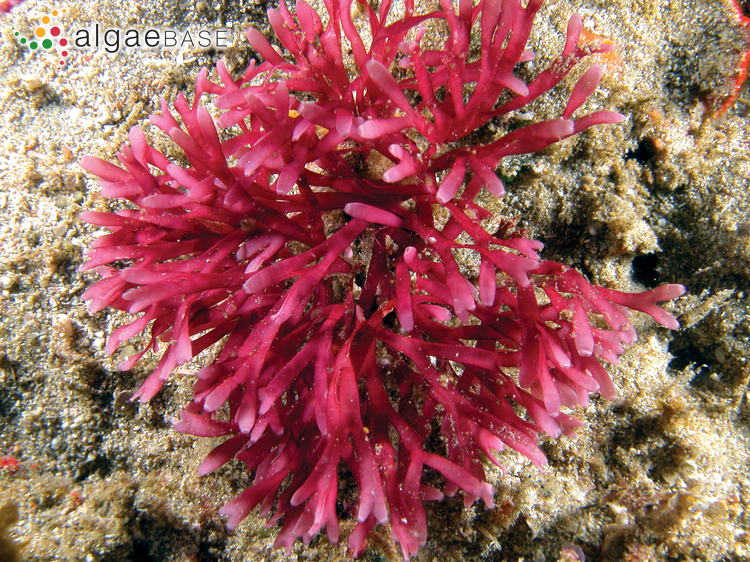 Phylogenetic relationships of Dichotomaria (Nemalionales, Rhodophyta) with the proposal of Dichotomaria intermedia (R.C.Y. Chou) comb. nov.. Botanica Marina 57(1): 27-40.